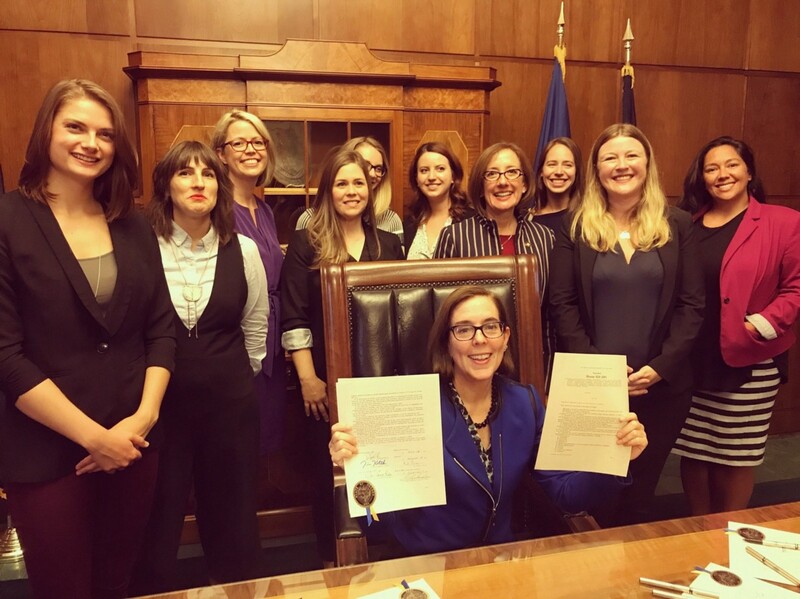 Governor Kate Brown signs the Reproductive Health Equity Act into law, August 2017. This statement should tell Oregon voters everything they need to know about Buehler’s stance on reproductive rights. Our electorate has shown time and time again that it is strongly committed to safe and legal abortion — in fact, we are the only state in the nation that has been able to fight every legislative attack on abortion since Roe vs. Wade was decided in 1973. Buehler knows this, and in his campaign to be the first Republican elected to the Governor’s office since 1982 he aims to confuse voters by masquerading as a moderate pro-choice lawmaker with a mild affinity for promoting access to contraception, despite the fact that he continues to attack women’s rights to make the best choices for their own lives, undermine access to reproductive healthcare services for the most vulnerable Oregonians, and send overt signals to conservative anti-abortion voters that he is, in fact, on their side. The only thing that differentiates Buehler from the most extreme members of his party is that he acknowledges that contraception can be an effective tool in preventing unplanned pregnancy — but then voted against providing insurance coverage for contraceptive services. Dr. Buehler even broke with almost every medical organization in the state, including the Oregon Nurses Association, the Oregon Medical Association, and the Oregon Association of Hospitals and Health Systems in urging a no vote on Measure 101 in January of 2018 — a vote that would have eliminated access to basic healthcare, including contraception, for hundreds of thousands of low-income Oregonians who rely on Medicaid coverage. At NARAL Pro-Choice Oregon, we have been fighting for over 40 years to develop a constituency across our state that holds elected officials accountable for their commitment to this basic human right. Throughout the country, we see what happens when government is dominated by men like Buehler, who see it as their job not only to tell women that abortion is the “wrong option” but to put barriers in place that make it nearly impossible to access affordable, safe, and dignified reproductive healthcare. Clinic closures in Texas. Abortion bans in Iowa and Ohio. Emboldened fake clinics offering medical misinformation to women while receiving state and federal funding. Knute Buehler won’t protect Oregonians from any of this. He postures as a maverick who is not beholden to his party’s extreme anti-abortion ideology, but his hubris in believing that he knows best for women and his refusal to support access to basic reproductive healthcare means that in Buehler’s Oregon, these kinds of unbearable restrictions could all be fair game. Right now, in Oregon, we have a Governor who is not only true to her pro-choice position but understands that women cannot truly make the best decisions about when and if to become a parent unless they have equitable access to reproductive healthcare services. Governor Kate Brown did not become pro-choice to win public office — she has spent her entire career fighting for the rights of women and has the voting record to prove it. I do not want to wake up on November 7th in Knute Buehler’s Oregon, with a leader who shames women and questions their ability to make the best decisions for their lives. I want to continue to live in the most pro-choice state in the nation, one in which bold leaders pass policies that ensure equitable access to reproductive healthcare for all people and stand up to the extreme anti-abortion activists who consistently attempt to roll back women’s rights. Knute Buehler does not represent Oregonian’s pro-choice majority and voters should not be fooled — the only candidate truly committed preserving the right to safe, legal abortion in Oregon is Governor Kate Brown.